Whale Tankers and its wholly owned subsidiary, Whale Enterprise, are jointly displaying their range of cleaning equipment, accessories and parts at Facilities Management Expo at the Dubai World Trade Centre, Dubai this week (19-21st May). 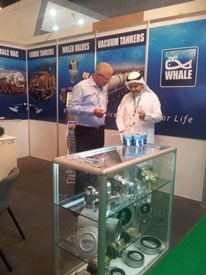 Whale – a leading European tanker and cleaning equipment specialist with a growing presence in Indian and Middle Eastern markets – is using its stand (Stand D151) at FM Expo to highlight both companies’ product ranges in the facilities management and infrastructure maintenance arena and to discuss customers’ individual tanker and jetting requirements. Both Whale Tankers and Whale Enterprise also act as agents for a number of leading parts brands, which are also on display. These include a comprehensive selection of nozzles to meet different cleaning applications as well as Molex valves, Mistral filters and examples of sewer jetting hoses. Also on display on the Whale stand at FM Expo is the latest Whale LITEJET unit – a powerful and economical cleaning and jetting unit, which has been designed to fit either into a small light commercial vehicle (LCV), be trailer mounted or deployed as a stand-alone static or trolley unit, dependent on customer requirements. The Whale team at FM Expo this week – all of which who are available to discuss individual customer requirements – are Anees Ahamed (Business Development Manager, Whale Enterprise) Paul Sharpe (Parts Manager ,Whale Tankers) Chris Anderson (Commercial Director, Whale Tankers)and Mark Warmington (Managing Director).